Boston Original Contact Lens Solution, 3.5 oz. 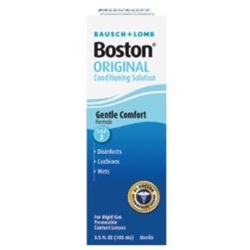 Sterile Boston Original Gentle Comfort contact lens solution in 3.5 oz. bottle. Chlorhexidine Gluconate & Edetate Disodium coats the surface of the lens to make them smooth and comfortable. Manufactured by Bausch & Lomb. Comes as singles.